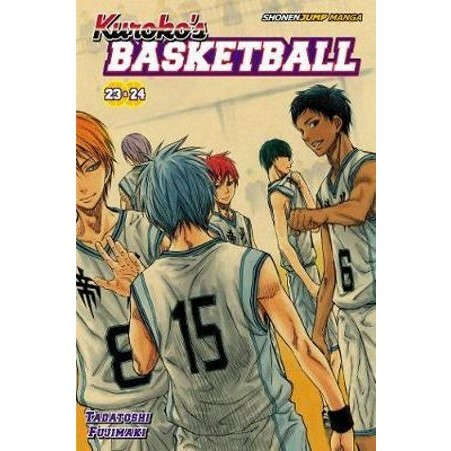 Seirin High's greatest basketball superstar was the one no one literally saw coming-the invisible Kuroko! Tetsuya Kuroko doesn't stand out much. In fact, he's so plain that people hardly ever notice when he's around. Though he's just as unremarkable on the basketball court, that's where his plainness gives him an unexpected edge-one that lets him execute awesome moves without others noticing! Seirin's taken the lead in the semifinal game against Kaijo, but they're in a bad spot when Kise returns to the court and turns the game around with his Perfect Copy move. Can Kuroko and the rest of the team concoct a strategy to deal with Kise?! Find out which teams moves on to the final match!